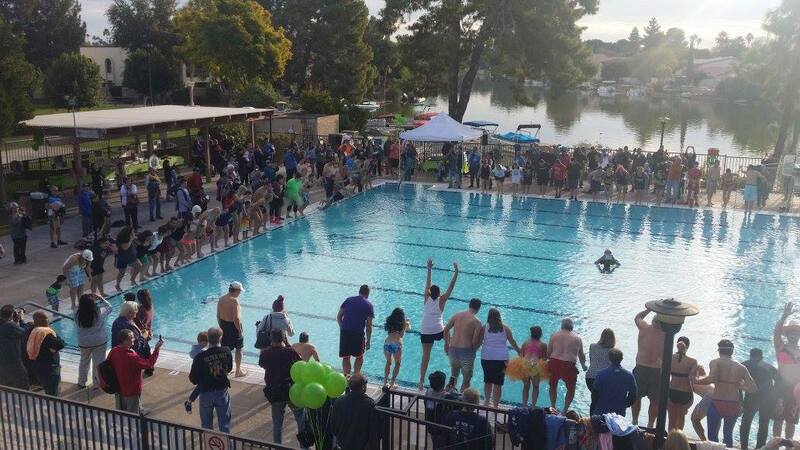 Thrill-seekers will once again participate in a desert-style, unified polar plunge benefiting Tempe’s adapted recreation programs. The 5th annual Polar Bear Plunge will be held at 8 a.m. on Saturday, Jan. 9, 2016 in the community swimming pool at The Lakes of Tempe, 5501 S. Lakeshore Dr.
Brave Polar Bears will plunge into the cool pool while Teddy Bears cheer from the dry pool deck. The entry fee is $20 for either Bear and includes a cool long-sleeve t-shirt, hot beverages, yummy snacks and the warm fuzzies that come from giving back. Registration is available online or on-site the morning of the plunge. Since the inaugural plunge in 2012, we have raised more than $25,000, helping to ensure members of our special needs community have the financial resources to participate in recreational and social activities. Some of these include the Tempe High and Tempe Elementary School District adapted PE programs, Tempe Special Olympics, The Centers for Habilitation, City of Tempe’s Buddy Bowling, Camp Challenge, Fabulous Friday Night Dances, and much more! The 2013 Polar Plunge fell on the coldest Arizona morning in 20-plus years (temperature reading at time of plunge was 26 degrees – BRRR!). Not even freezing temperatures (literally) could keep the bears away. More than 85 Polar Bears plunged into the icy swimming pool and raised $5,850. In 2014, nearly 150 Polar Bears took the plunge not only in Tempe, but our Freedom Bears serving in Operation Enduring Freedom took the plunge in Afghanistan. The combined global-effort raised nearly $7,800. The 2015 Polar Plunge saw a record number Polar Bears earn their bragging rights and raised nearly $8,500.